The S.O. points me to this article in which the author questions the depiction of Twilight creator Stephenie Meyer in the upcoming Female Force comic biography. 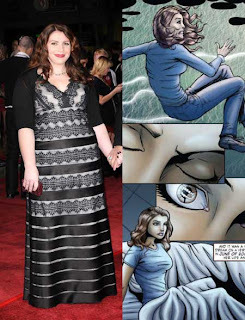 In short, is it okay for a comic to depict a plus-size woman as if she were skinny? In an effort to avoid a long-winded answer, I'd say yes, they have that right. HOWEVER, doing so damages their credibility. If Bluewater wants to continue to produce biographic comics, it seems to me that they should try to adhere to the people's actual biographies as much as possible. Otherwise, it WILL get around that they take wild liberties which will ultimately hurt overall sales, even on their attempts to cash in on the popularity of the celebrity du jour. It's okay if she only put on all that weight after she got famous, which, if Jezabel had actually done their research, is exactly what happened to Stephenie Meyer.